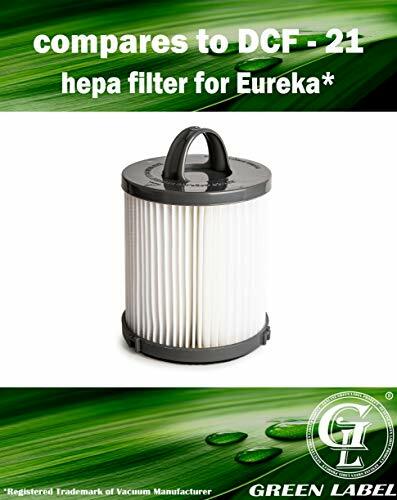 This is a Green Label Allergen Dust Cup Foam Filter for Eureka Hand Vacuum Cleaners. The kit compares to Eureka OEM # 67821, 68931, 68931A, EF91, EF-91, EF-91B and fits the models: Comfort Clean 4236AZ, AirSpeed Pro All Floors Rewind Pet AS1061A, AirSpeed PET AS1008AX, AirSpeed Gold Rewind AS1048A, AirSpeed Pet AS1002A, AirSpeed Gold AS1001A, AirSpeed AS1000A, AirSpeed Rewind Pet AS1041A, AirSpeed AS1004A, WhirlWind Rewind 4242A. The package contains: 1 x HEPA Filter. Filters are essential for your vacuum cleaner to function properly. They trap fine dust particles and allergens, preventing them from recirculating into the air of your home. It is important to clean and replace them regularly for them to work. This Filter is washable and reusable. It can be cleaned by rinsing it under running water. The washable filter should be completely dry before placing it back in your vacuum. No questions asked return policy. Fully refundable. Green Label is a premium and environmentally friendly manufacturer of aftermarket vacuum and steam mop filters and accessories. All vacuum brand and model names are registered trademarks of vacuum manufacturers. This product is designed and manufactured by Green Label. This is not a Eureka OEM product and is not covered under Eureka manufacturer's warranty. The Eureka brand names and logos are the registered trademarks of their respective owners. Any use of the Eureka brand name or model designation for this product is made solely for purposes of demonstrating compatibility.